What is this connection with the earth that we humans cling to so tenaciously? As a species we obviously are dependent on the air to breathe, the water and soil that nurture us, the sun whose fiery presence holds us in its eternal circle. But the earth is more than the elements that give us life. The earth holds millions of memories in the folds of its mountains, across the tapestry of its lands and in the rhythmic singing of its seas. For we as humans attach ourselves to this earth, not just for nurturance, but by the profound evocations of time, memory and place. The book argued that science-dominated modern society was ugly, repressive and soulless; that youthful dissent was coherent enough to be termed a culture; and that this anti-rationalist “counterculture” — a term Dr. Roszak popularized and may have invented — might offer the foundation of a new visionary civilization. Years later Roszak returned to this view of disconnection in The Voice of the Earth and Ecopsychology when he contended that in our urban industrial society madness results when there is a lack of balance with nature. He believed that humankind needs to “recapture the sense of being embedded in nature” and of “having a reciprocity with nature.” For Roszak, the human psyche, a product of millions of years of evolution, must return to that harmony with nature that first defined humans’ earliest collective gatherings. Let us look at one historical example of Roszak’s theory of balance and reciprocity, and as well learn the true origins of an urban legend whose symbolic cry for Mother Earth put a 20th century spin on an age-old relationship. Chief Seattle. This image is in the public domain in the United States. Seattle was leader of the Suquamish Indians, a Lushootseed or Puget Salish speaking people living along the Kitsap Peninsula across Puget Sound from present day Seattle. The Suquamish have lived in this region for approximately 10,000 years. Their name translates into the “people of the clear salt water.”  Seattle was a great orator, as were many of the leaders of the Coast Salish leaders. It was a highly valued and practiced skill in their culture. In 1854 Seattle gave a speech at the arrival of the first American territorial governor, Isaac Stevens. Also listening was Dr. Henry A. Smith, who supposedly understood Coast Salish languages or Chinook Jargon, which was the language used in trade. Interestingly, it wasn’t until 33 years later that Dr. Smith published his translation of the speech in the Seattle Star newspaper. There is much issue to be taken with the translation and today we still have no conclusive proof of what Chief Seattle said at this momentous occasion. However, while the exact words of Chief Seattle are not known, some documents of the day supported parts of the translation and provided insight into the leader’s sense that cataclysmic change had arrived. In his words as translated, Chief Seattle feared the destruction of his people and their way of life. He saw the unrelenting threat, physical and metaphysical, of the encroaching white man. Governor Stevens was tasked with gaining claim to the Suquamish land so that the transcontinental railroad could be extended to Puget Sound. Recognizing that his people were outnumbered and that bloodshed was inevitable if they fought the white man, Chief Seattle had little choice. 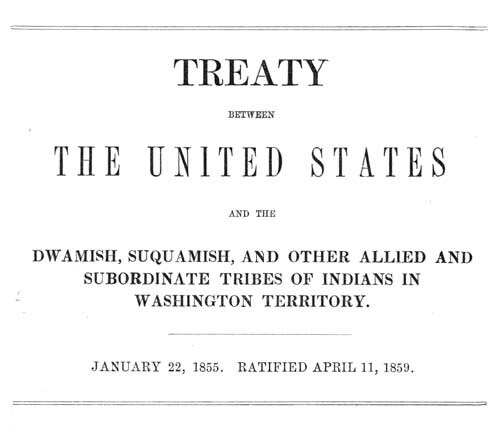 On January 22, 1855, Chief Seattle and other tribal leaders signed the Treaty of Point Elliot, thereby relinquishing all rights. Eventually, the Suquamish people were relocated to the Port Madison Indian Reservation. How did the urban legend come about? Credit the passage of time, a growing concern for the environment, a distaste for historical imperialism and some compelling screenwriting. You must teach your children that the ground beneath their feet is the ashes of our grandfathers. So that they will respect the land, tell your children that the earth is rich with the lives of our kin. Teach your children what we have taught our children that the earth is our mother. Whatever befalls the earth, befalls the sons of the earth. If men spit upon the ground, they spit upon themselves. This we know. The earth does not belong to man; man belongs to the earth. This we know. All things are connected like the blood which unites one family. All things are connected. Whatever befalls the earth befalls the sons of the earth. Man did not weave the web of life; he is merely a strand in it. Whatever he does to the web, he does to himself. Why are we so willing to accept a text like this if it’s attributed to a Native American? It’s another case of placing Native Americans up on a pedestal and not taking responsibility for our own actions. So despite the reasons behind the legend, over the years Chief Seattle’s words have come to represent the annihilation of the harmonious co-existence of nature and indigenous people. 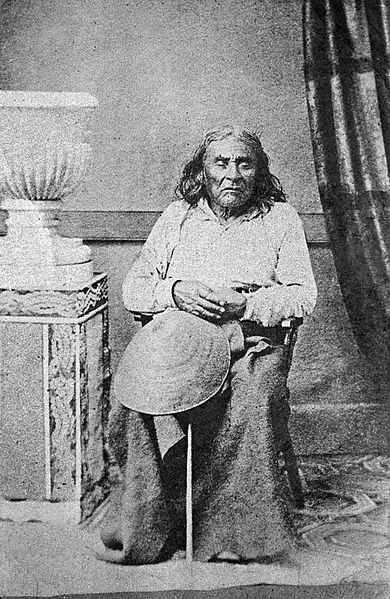 Chief Seattle became mythologized as the visionary who saw in the white man the reflection of the destruction of the only home his people had known—and a story recalled in countless aboriginal homelands across an expanding United States. A home that was not property, but a place of the heart and of the mind. A natural abode that passed from generation to generation of stewardship. In Voice of the Earth Roszak acknowledges that the Chief Seattle speech is apocryphal but also speaks to the spirit of what was penned by Perry. Other critics have said that imposing an outside philosophy on aboriginal people, no matter how well intentioned, is still cultural imperialism. And yet the myth stubbornly remains despite its specious history. Perhaps it is because regardless of provenance, the words bring back an image of a pristine land. From our modern perspective, we know what it to come. These words by Chief Seattle, fictionalized as they were, still resonate as a final cry to the dying symbiosis of earth and man. Since its earliest times humankind has sought a sense of belongingness even in the harshest climates and terrains. Every culture has made its pacts with the forces of nature. Its people have tilled the soil, plied the waters and brought plenty from the land. They have created gods whose spirits reside in earth and sky and give order and purpose to earthly days. All in the name of living together, man and nature. Harmony and balance, the stuff of human existence and natural order. So getting back to our original premise. What is home? From the above examples, it is what gives us identity, it is what keeps madness at bay, it is where we take root as a people. On this Earth Day let us listen to the earth and its beckoning. Let us cherish our home. In the embrace of time, memory and place, this is where we belong. 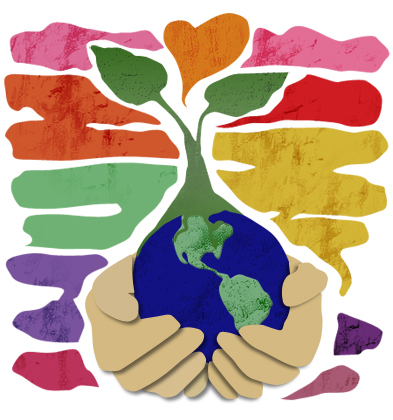 For more information, read “Awakening the Ecological Unconscious: Ecopsychology: healing our alienation from the rest of Creation” by Theodore Roszak. 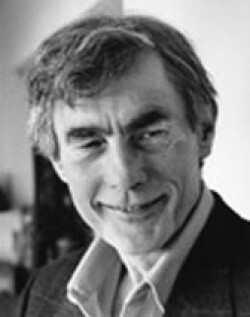 Ted Perry, film script for Home (prod. by the Southern Baptist Radio and Television Commission, 1972), reprinted in Rudolf Kaiser, “Chief Seattle’s Speech(es): American Origins and European Reception,” in Recovering the Word: Essays on Native American Literature, ed. Brian Swann and Arnold Krupat (Berkeley: University of California Press, 1987), 525-30. This entry was posted in Art, Biology, Blog, Culture, Holidays, Human Rights, Literature, Psychology, Public Life, Science and Technology and tagged AntiquityNOW, Chief Seattle, Earth Day, Ecopsychology, Environmentalism, Theodore Roszak, Where is home. Bookmark the permalink.